Doing charities is something very rewarding but doing them through art is a double joy. Not only are you helping others but you're doing it through something that you enjoy since you're doing it. That's the case of Charity Wings, a non profit organization that, in their own words "use art and creativity as a vessel to raise money and awareness". A couple of weeks ago I was asked for a contribution to this wonderful organization and I said yes right away! It's fantastic what this group of women have done and I'm grateful they let me be part of it. The angel Elena is holding was my contribution to them. It's an angel bringing a gift. A gift of hope for the ones who are in the receiving part of the charity and a gift of satisfaction for the givers. And of course, a gift of love for everybody. When you join Charity Wings, you won't be only giving, but also receiving goodies! Like a signed print of my Angel. To find out more about them go to their website and learn more about them and join the cause! This sounds like a great cause! I love your piece. I'm glad I got to see her holding it - I would not have known it was so big! Going to check out Charity Wings' website after commenting here. Thank you for sharing this amazing opportunity to give through art. 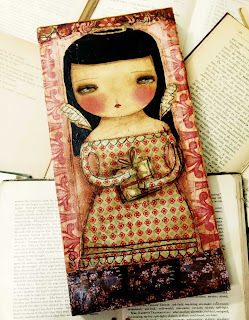 Just had to visit your blog after seeing your gorgeous art in Artful Blogging! I love that it seems so inspired by Frida Kahlo...one of my favorite artists! Seeing her home in Mexico City was one of my favorite travel experiences. I really love this idea :) Wonderful!